Η Toyota δε θα μπορούσε να μη φέρει μαζί της στη Γενεύη το νέο της, Yaris HSD concept. 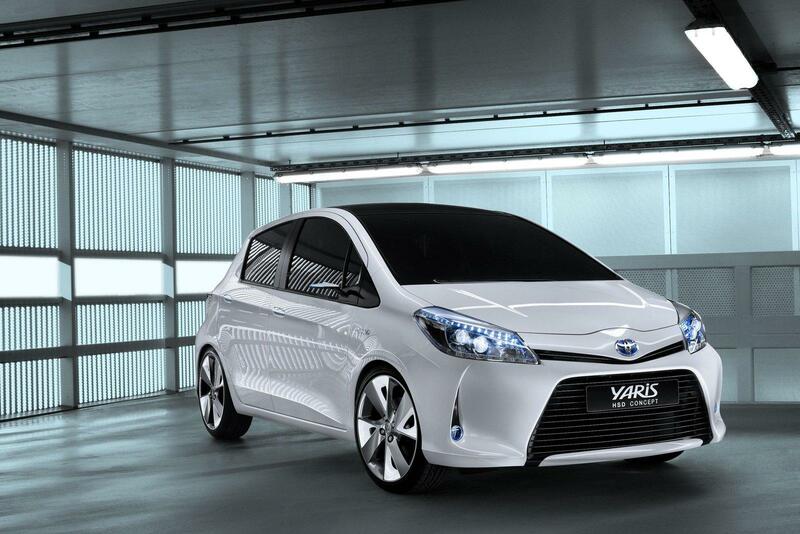 Το πρωτότυπο Yaris Hybrid Synergy Drive (HSD), αποτελεί ένα υβριδικό όχημα στην κατηγορία των μικρών αυτοκινήτων, την μεγαλύτερη σε πωλήσεις κατηγορίας της Ευρώπης και φαίνεται ότι θα το δούμε στους δρόμους κάπου στα μέσα του 2012. Με νέες πιο επιθετικές γραμμές και μια θηριώδη εισαγωγή αέρα στον εμπρός προφυλακτήρα, το νέο Yaris κάνει αμέσως έκδηλες τις διαθέσεις του, όμως δεν σταματά εκεί, αφού σε αυτό συνάδουν οι 18άρες ζάντες και τα LED φώτα ημέρας. Στην οροφή έχουν τοποθετηθεί φωτοβολταϊκά panel που δίνουν ρεύμα στον κλιματισμό του αυτοκινήτου. Μηχανικά τώρα, παρότι επίσημα στοιχεία δεν δόθηκαν, αλλά λογικά θα φορά τον ίδιο HSD σύστημα με τα Prius και Auris HSD. Τι σημαίνει αυτό; Να περιμένουμε έναν τετρακύλινδρου κινητήρα 1.8 λίτρων 98 ίππων ο οποίος θα συνδυάζεται με έναν ηλεκτροκινητήρα 60 kW (80 ίππων). Στόχος των Ιαπώνων με αυτό το μοντέλο είναι να θέσουν νέα standards στην κατανάλωση και τους ρύπους. Toyota’s goal is to offer full hybrid power in all its models in Europe as early as possible in the 2020s, a programme which began in 2010 with launch of Auris HSD in the C-segment. Yaris HSD will bring Hybrid Synergy Drive to the supermini B-segment, which accounts for the largest share of the European new car market. The current growth of the B-segment is one aspect of a shift in public demand. Customers are becoming less brand-loyal, more open to products outside the mainstream and more receptive to new technologies. There is also a significant increase in the number of customers who are making engine type their primary purchase consideration. Public perception of hybrid has matured to the point where it now ranks as a clear alternative to diesel or petrol engines. The number of people choosing hybrid is increasing steadily and has doubled in the past two years. This has created a gateway to the Toyota brand: customers looking to buy a hybrid are three times more likely to consider a Toyota than those intending to purchase a conventional diesel or petrol car. Toyota’s proven Hybrid Synergy Drive is aimed principally at demanding, urban customers who expect a new driving and ownership experience from their car. Delivering low fuel consumption, emissions and cost of ownership with relaxed and quiet performance, HSD proves that environmental responsibility and low running costs do not have to compromise driving pleasure. Among the first Auris hybrid owners, the majority quote relaxation, an engaging driving experience and the learning of new driving habits as the most rewarding aspects of their new car. 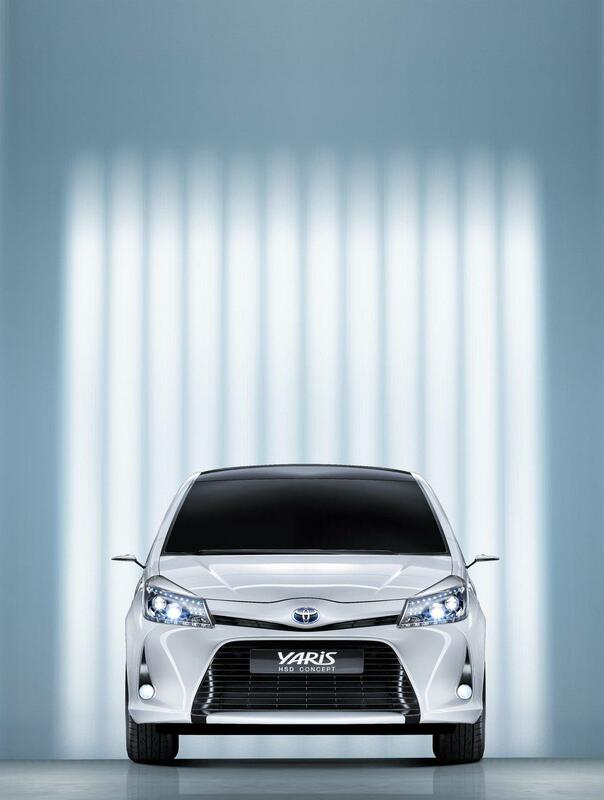 Exterior design – a new direction for the next Yaris The Yaris HSD concept inherits the clever packaging that has historically been a fundamental of element of Yaris, with a spacious and practical interior married to a more advanced and sophisticated exterior design. The upper grille opening is shallow, flanked by highly contoured headlamps, promoting a smooth airflow over the upper body. The Toyota emblem is fully integrated into the front lip of the bonnet. In profile, the car’s monoform shape is emphasised by a long, sweeping roofline and single, crisp character line running the length of the vehicle. 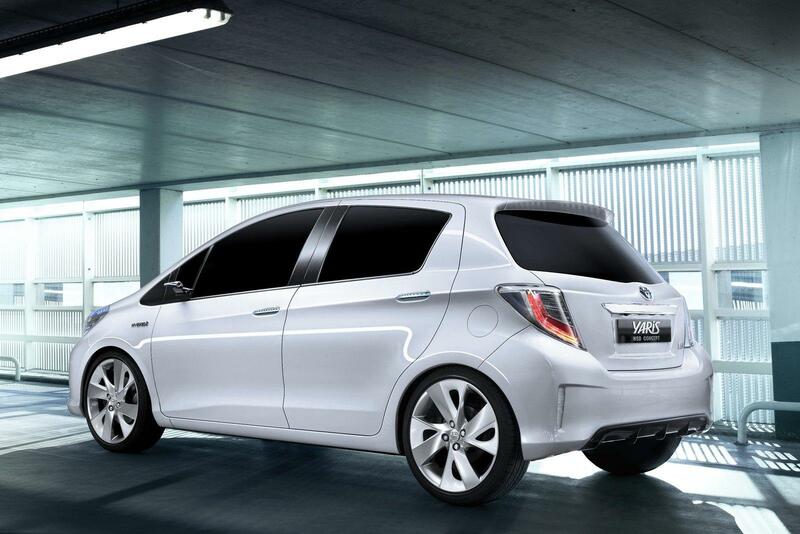 Short front and rear overhangs and a long wheelbase maximise the room inside for passengers and luggage. 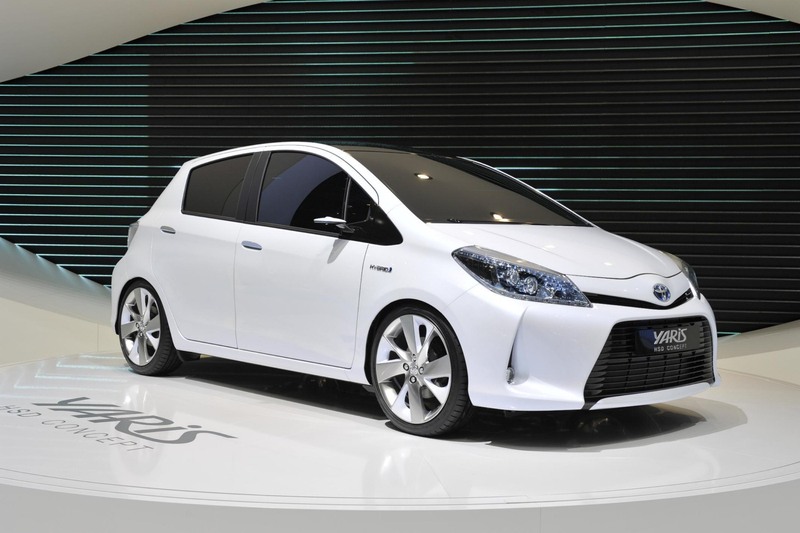 There are a number of styling cues that identify the car as a Toyota full hybrid. 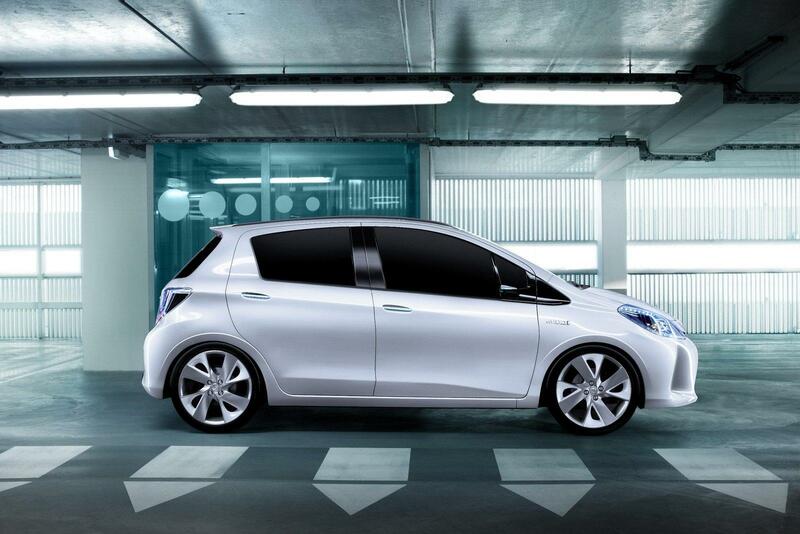 Flat, vertical ‘aero’ corners minimise air turbulence and house front foglamps and matching rear reflectors. Airflow is also managed by a large, integral rear spoiler, underbody covers and 18-inch aero wheels with enlarged gaps to promote cooling. Attention to detail extends to the aero-efficient shape of the door handles and rear side view cameras (featured in place of conventional door mirrors). The hybrid-specific white pearl paintwork is exclusive to the concept car and shows off a new development of this finish, with sparkling blue metallic accents created using multi-layering application techniques. The car’s Hybrid Synergy Drive is further indicated by hybrid blue Toyota badging, LED daytime running lights and ‘synergy’ blue illumination of the rear-view camera housings and doorhandles. Hybrid Synergy Drive in the B-segment Fuel efficiency and low CO2 emissions are established attractive qualities in the B-segment. Toyota’s Hybrid Synergy Drive will carry these forward with the additional benefit of offering fully electric driving capability – a function that is particularly effective in urban environments. In all-electric EV mode the system produces zero CO2, NOx and particulates tailpipe emissions. 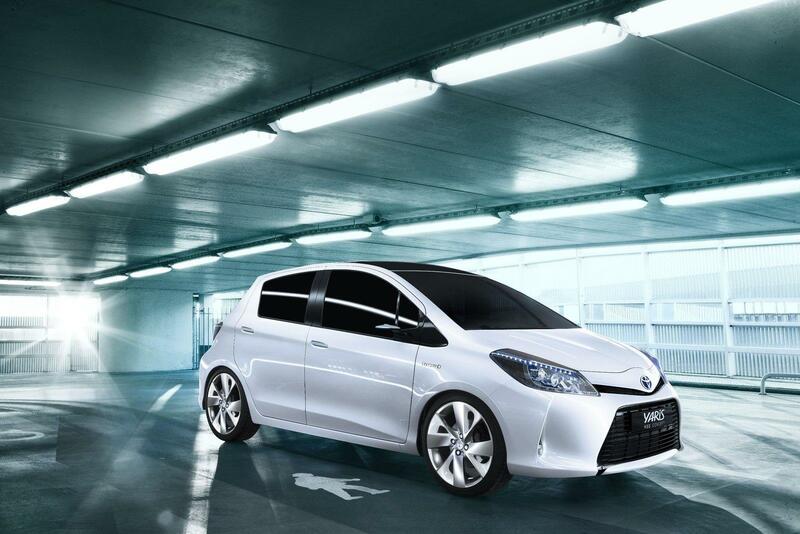 Every Toyota full hybrid comes with low cost of ownership built-in. The high fuel efficiency and low emissions save on fuel bills, attract tax benefits and inner city congestion charge exemptions and keep running costs down. Moreover, Hybrid Synergy Drive is designed for low maintenance requirements and hard-wearing performance. The system has no starter motor or alternator, the timing chain is maintenance-free and there are no drive belts, which improves reliability and saves on upkeep bills. Toyota engineers continue to focus on how overall system performance can be improved by capturing solar power. 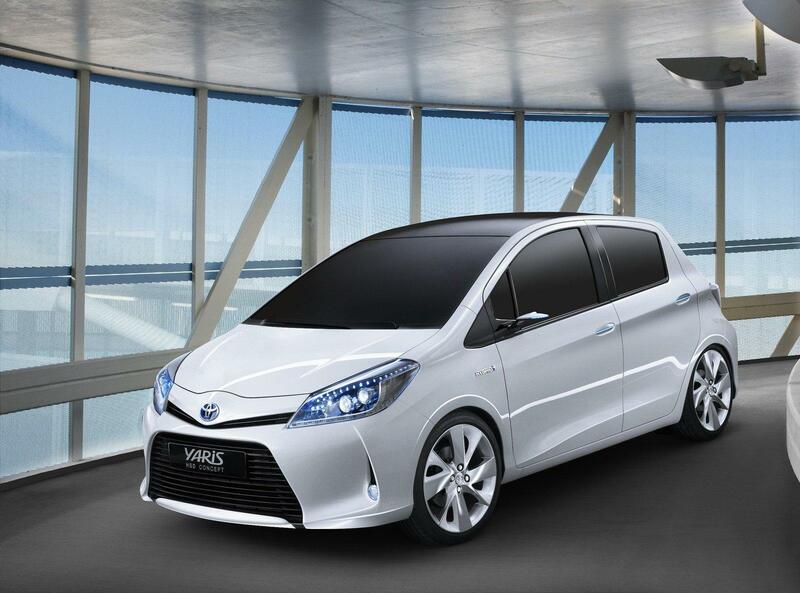 Yaris HSD’s roof is entirely covered with solar panels, to provide independent powering of the car’s air conditioning unit, thus reducing fuel consumption. HSD powertrain downsizing – the engineering challenge Introducing full hybrid technology to the B-segment has presented Toyota with some unique engineering challenges. The powertrain design has to be tailored for installation within Yaris’s compact and extremely efficient packaging, without compromising its quality and performance, or detracting from the passenger accommodation and loadspace. 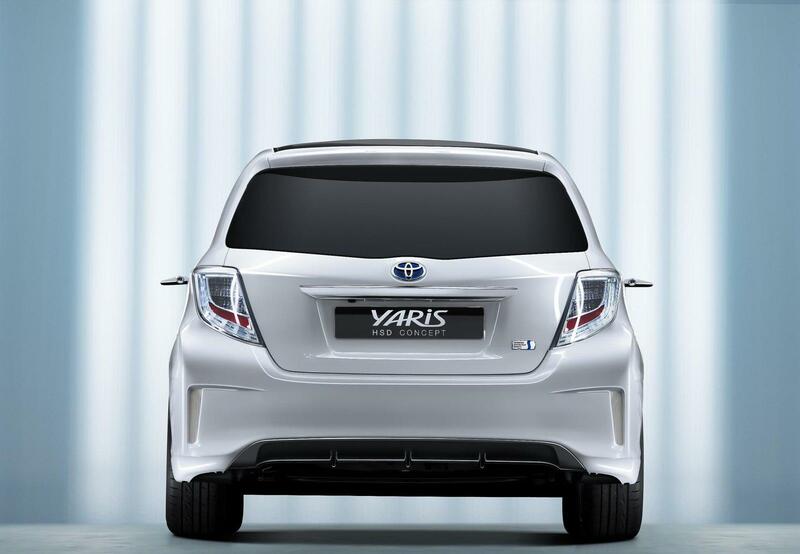 Success in this task is essential to meet the growing demand for urban-friendly family vehicles, in which space and the benefits of hybrid performance are prime requirements. 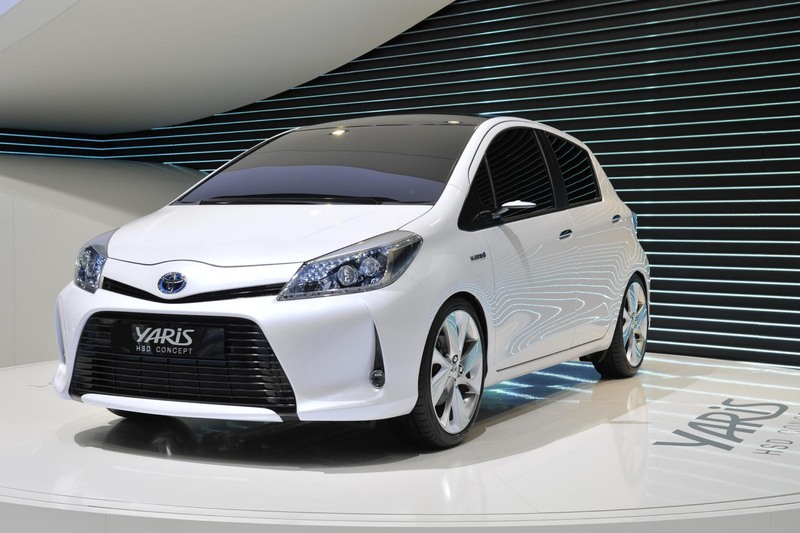 European production The production model which will follow the Yaris HSD concept will be launched throughout Europe during the second half of 2012. 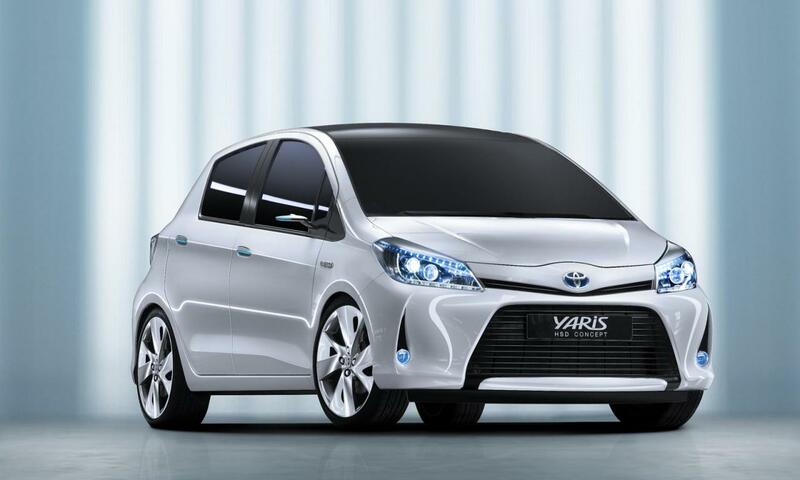 Cars will be built at Toyota Motor Manufacturing France’s Valenciennes plant. Full hybrid technology will become an increasingly significant part of Toyota’s mainstream vehicle production in Europe. With Auris hybrid already being built at Burnaston in the UK, Toyota is the only car manufacturer to be producing hybrid vehicles at more than one European factory.